Color: Living animals are turquoise bluish green. The parapodial margin is a burnt orange color. Below that is a narrow line of black followed by a region of vivid blue pigment. This black and blue pigment is also on the head and the mid region of the rhinophores. 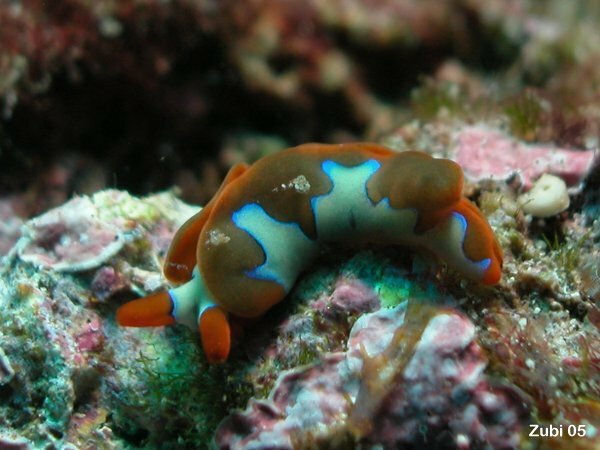 The tips of the rhinophores are orange while the base are the same turquoise blue-green of the body. Orange, black and blue bands are also present on the anterior margins of the foot.